The problem we are trying to solve: From recent experience I find that scalability and performance are some of the key motivating factors that drive people to use Apache Spark. In that context, my colleagues and I have been involved in a few development projects around Spark lately and found the need to collect workload metrics and instrumentation for performance analysis and troubleshooting. Spark (I refer to Spark 2.1.0 in this post), comes with many instrumentation points, however I find that it is not always easy nor fast to identify and collect all the needed data, possibly from multiple sources, as needed for root-cause and performance analysis. That's why this post covers some ideas, tools and additional custom development on the topic of collecting Spark performance metrics that I find useful for troubleshooting and analysis of Spark workloads. The problem with investigating performance by just measuring elapsed time is that this approach often does not provide insights on why the system performs in a certain way. Many are familiar with a related pitfall that comes from using "black box" benchmark workloads. It is often found that the results of a benchmark based on measuring latency of a reference workload do not generalize well to production use cases. Typically you need to fig to the root cause analysis and find what is happening behind the hood. This is valid in general when doing performance investigations/drill-down, in this post we apply these ideas to Spark investigations. The Spark WebUI is the next obvious place to go to for additional information and measurements when troubleshooting, or just monitoring job execution. For those of you knew to Spark, the WebUI is normally accessible by pointing your browser to port 4040 of the driver node. The WebUI is OK for interactive troubleshooting , however it lacks flexibility for performing custom aggregations and metrics visualizations, among others. The next stop is Spark's REST API (see also Spark documentation "Monitoring and Instrumentation"), which makes the information available from the WebUI available through a REST interface. This opens the possibility to write custom analysis on the captured metrics. Moreover the API exposes a list of metrics, including CPU usage that in some cases go beyond what is exposed from the web pages of the WebUI (as of Spark version 2.1.0). For completeness I want to mention also Spark's metrics system that can be used to send metrics' data to several sinks, including Graphite, to monitoring purposes. Note: if you are new to Spark before reading further I advise to get an overview of Spark execution model (see for example "Job Scheduling") and make sure you have a practical understanding of what Jobs, Stages and Tasks are. Spark listeners are the main source of monitoring information in Spark: the WebUI and the rest of the instrumentation in Spark employs a variety of "Listeners" to collect performance data. For the scope of this post you just need to know that listeners are implemented as Scala classes and used by the Spark engine to "trigger" code execution on particular events, notably one can use the listeners to collect metrics information at each job/stage/task start and end events. There is more to it than this simple explanation, but this should be enough to help you understanding the following examples if you are new to this topic (see the references section of this post for additional links to more detailed explanations). Spark listeners are used to implement monitoring and instrumentation in Spark. This provides a programmatic interface to collect metrics from Spark job/stage/task executions. User programs can extend listeners and gather monitoring information. Metrics are provided by the Spark execution engine at for each task. Metrics are also provided in aggregated form at higher levels, notably at the stage level. One of the key structures providing metrics data is the TaskMetrics class that reports for example run time, CPU time, shuffle metrics, I/O metrics and others. Key learning point: it is possible to attach a listener to an active Spark Context, using: sc.addSparkListener). For completeness, there is another method to attach listeners to Spark Context using --conf spark.extraListeners, this will be discussed later in this post. The rest of this post covers a custom tool I have developed in Scala to collect Spark workload/performance metrics and ease their analysis: sparkMeasure. sparkMeasure can also be used in "Flight Recorder" mode, recording all metrics in a file for later processing. Another option is to compile and package the jar using sbt. Example 1a: A basic example using spark-shell (Scala). The first conclusion is that the job executes almost entirely on CPU, not causing any significant activity of shuffle and/or disk read/write, as expected. You can see in the printed report that the job was executed with 3 stages and that the default degree of parallelism was set to 8. Executor run time and CPU time metrics, both report cumulative time values and are expected to be greater than the elapsed time: indeed their value is close to 8 (degree of parallelism) * elapsed (wall clock) time. the stageMetrics class works as "wrapper code" to instantiate an instance of the custom listener "StageInfoRecorderListener"
finally when the execution of the code (an SQL statement in this case) is finished, runAndMeasure exports the metrics into a Spark DataFrame and prints a cumulative report of the metrics collected. Note that the syntax for the Python example is almost the same as for the Scala example 1a, with the notable exceptions of using sc_jvm to access the JVM from Python, and the use of spark._jsparkSession to access the relevant Spark Session. Another difference between Scala and Python, is that the method stageMetrics.runAndMeasure used in example 1a does not work in Python, you will need to break down its operations (time measurement and reporting of the results) as detailed in the example 1b. The workload/SQL execution takes about 5 minutes of elapsed time (wall-clock time, as observed by the user launching the query). The total time spent executing the SQL by all the tasks is about 3 hours. 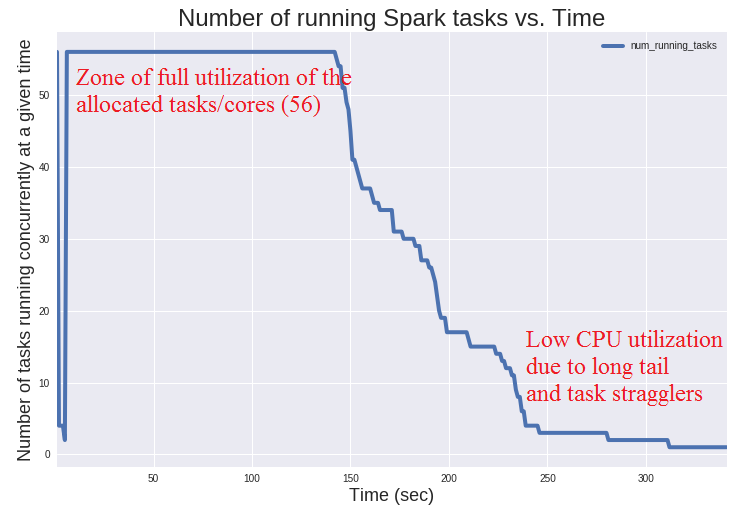 The plot of the "Number of running Spark tasks vs. Time" (see below) can give you more clues on why the allocated CPUs were not fully ustilized during the workload execution. You can see that (1) in the first 150 seconds of the workload execution, the system uses all the available cores, after that it starts to slowly "ramp down", finally an important amount of time is spent on a long tail with some "straggler tasks". This provides additional information on why and how the SQL query under study was not able to use all the available CPUs all the time, as discussed above: we find that some of the available CPUs were idle for a considerable amount of time. It is worth reminding that this particular workload is CPU bound (i.e. no significant time is spent on I/O or other activities). For the pourpose of this post we can stop the analysis here. You can find the code for this analysis, with plots and additional drill down on the collected metrics in the notebook at this link. Why is this useful: Performing analysis of the workload by drilling down into the metrics collected at the task level is of great help to understand why a given workload performs in a certain way and to identify the bottlenecks. The goal is also to derive actionable information to further improve the performance. You may be already familiar with investigating Spark performance using the Event Timeline in the Spark WebUI, which already makes this type of investigations possible. The techniques discussed in this post allow to extend and generalize the analysis, the idea is that you can export all the avalable metrics to your favorite analytics tool (for example a Jupyter notebook running PySpark) and experiment by aggregating and filtering metrics across multiple dimensions. Moreover the analysis can span multiple stages or jobs as needed and can correlate the behavior of all the collected metrics, as relevant (elapsed time, CPU, scheduler delay, shuffle I/O time, I/O time, etc). Another point is that having the metrics stored on a file allows to compare jobs performance across systems and/or application releases in a simple way and opens also the way to automation of data analysis tasks. Flight recorder mode addresses the casse when you need to instrument a Spark application but do not want (or cannot) add code to your job(s) to instantiate the custom listeners and attach them to the active Spark Context (for example using StageMetrics and/or TaskMetrics class, as was the case in the previous examples). You can deploy the metrics data collection in offline ("flight recorder") mode by adding custom listener code into Spark ListenerBus when starting the Spark Context. Export metrics for offline analysis if you need to go beyond the simple reports provided with sparkMeasure and import them in your tool of choice (for example a notebook-based environment). Collecting and analyzing workload metrics beyond simple measurement of the elapsed time is important to drill down on performance investigations with root-cause analysis. sparkMeasure is a tool and proof-of-concept code that can help you collect and analyze workload metrics of Apache Spark jobs. You can use sparkMeasure to investigate the performance of Spark both for Scala and Python environments. You can use it from the command-line shell (REPL) or Jupyter notebook or as an aid to instrument your code with custom listeners and metrics reports. It is also possible to use sparkMeasure to collect and store metrics for offline analysis. The available metrics are collected by extending the Spark listener interface, similarly to what is done by the Spark WebUI. The collected metrics data are transformed into Spark DataFrames for ease of analysis. sparkMeasure allows to collect metrics at the Task level for fine granularity and/or aggregated at Stage level. The collected metrics data come from existing Spark instrumentation. For the case of Spark 2.1.0 this includes execution time, CPU time, time for serialization and deserialization, shuffle read/write time, HDFS I/O metrics and others (see more details in sparkMeasure documentation and code). See also this example analysis of Task Metrics data using a notebook. This work has been developed in the context of the CERN Hadoop and Spark service: credits go to my colleagues there for collaboration, in particular to Prasanth Kothuri and Zbigniew Baranowski. Thanks to Viktor Khristenko for direct collaboration on this topic and for his original work on the instrumentation of spark-root with Spark listeners. Other material that has helped me for the development of this work are Jacek Laskowski's writeup and presentations on the subject of Spark Listeners and the presentation "Making Sense of Spark Performance" by Kay Ousterhout. The Spark source code and the comments therein have also been very useful for researching this topic. In particular I would like to point to the Scheduler's code for the Spark Listener and the WebUI's JobProgressListener.